LOA: 39' Beam: 13' 11" Draft: 2' 4"
The Master is very spacious and has the unique feature of a small vanity with sink in the room--see photo. There is a lot of storage space all around this room. * Opening Hatch 12' X 12"
This second Stateroom has quite a few unique features. The over/under bunks can be converted to a salon sofa. There is a hard sliding door for privacy, that also opens almost all the way to make this part of the Salon. In addition there is a sliding wall section(window size) that opens to the Galley. This can be closed for total privacy in the Stateroom. * Opening Hatch 12" X 12"
The Galley is to Stbd and AFT. This is a quite large and open Galley. The Refrigerator/Freezer was not working and has been removed. The new one is on order. The Head is to Port just AFT of the Master Stateroom. The shower is a separate compartment with a built in seat. There is a bi-fold door. * Ritchie Power Damp Compass 4.5"
The Engine Room is accessed thru floor panels in the Cockpit. 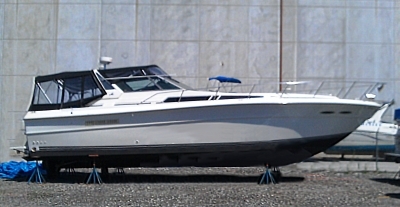 The 390 Express Cruiser turned out to be one of the most popular boats ever built by Sea Ray. 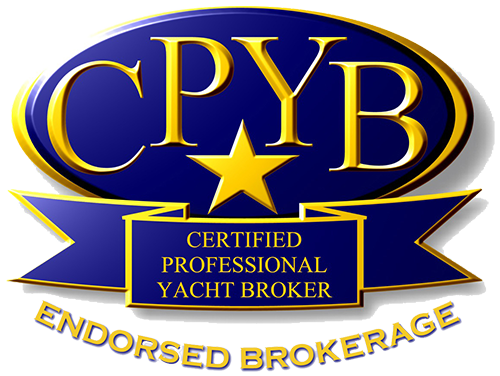 First of the big production express boats when she came out in 1984, her sleek lines and European styling—tame by today’s design standards—made a lasting impression on the mid-1980s sport-boat market. 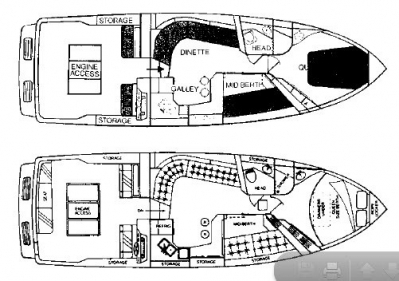 Below, her expansive two-stateroom interior is arranged with a queen berth forward and a combined galley-and-breakfast bar facing the curved settee in the salon. The guest stateroom is unique: it’s separated from the salon by a retractable mirrored bulkhead. Slide it away, convert the bunk berths into a sofa, and the area actually becomes a part of the main cabin. The 390’s interior was updated twice over the years, changing from the original wood grain mica to teak in 1986, and to a white-mica/teak-trim decor in 1988. Topside, the single-level cockpit is huge with seating for as many as eight passengers. 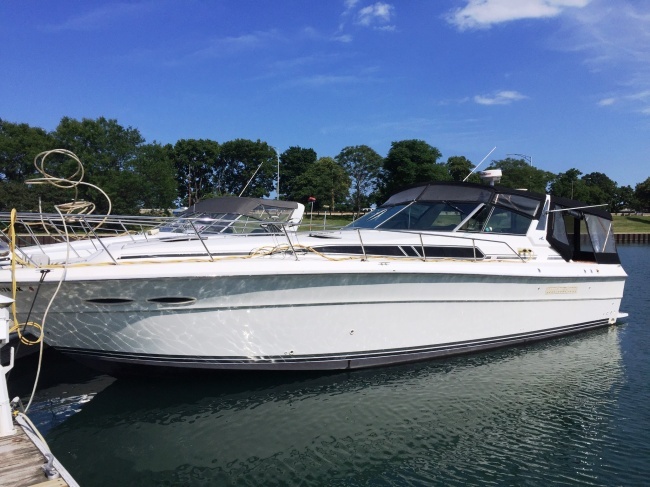 Twin 340hp inboard MerCruisers cruise the 390 Express Cruiser at 17–18 knots (mid-to-high 20s top).